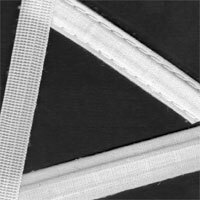 BONING: Boning is used in bustiers and strapless garments for support in the bust or torso. Bone Soir™ is an innovative boning material that allows for efficient sew- through processing, reducing time and cost of application. Both black and white are stocked in widths of 1/4”, 5/16” and 7/16”. Covered boning is also available in black and white and stocked for immediate delivery. Fused boning in black and white is a special order based on one week delivery.